1. Place chicken, onions, half the celery, salt, pepper and thyme in a large pot. Immerse completely with water bring to a boil. Reduce heat to low and simmer (covered) for 1 hour. 2. Take the chicken out of the pot and remove the meat from the bones (set aside). Place bones back in pot and continue cooking for 1 hour longer. 3. Strain broth and return to pot with remaining celery and carrots. Cook 20-30 minutes longer. 4. 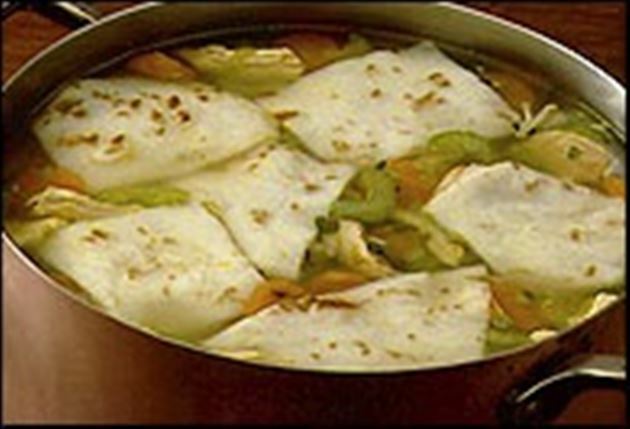 Stir in cooked chicken and top with tortilla pieces. Simmer for 5 minutes longer. Serve soup with remaining tortillas.